This Bright Copper Curly Roof Birdhouse features 4 separate rooms with perches and a roof in the shape of a bell. 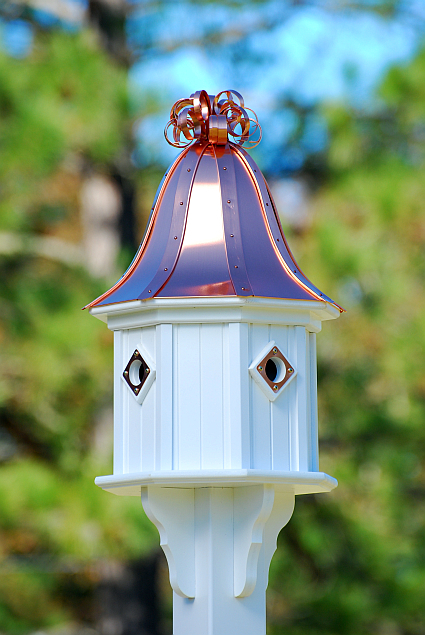 Copper Curly Roof Gazebo Bird Feeder is constructed to lift up for easy cleaning. Bright Copper Roof 14" Birdhouse with Curly Top - Measures 34" high x 14" wide, octagon shaped, PVC construction, 4 large nesting compartments with 1-1/2" openings for attracting many colorful songbirds, 4 copper portals, brackets attached, removable solid copper roof for easy cleaning, fits on 4" x 4" vinyl sleeve post which fits over 3 1/2" x 3 1/2" pressure treated wood post. Birdhouse comes complete with Vinyl 4 inch sleeve and attached decorative brackets - fits on a 4 x 4 post. NOTE:Post NOT included but the sleeve to mount the 4X4 post IS included. The sleeve is 4 inch sleeve that mounts on a 4 X 4 post. Post can be purchased at most home improvement stores. Available also with Patina Copper Roof.